The Honest Musky Journal is an accurate up to date record of all Honest Musky fishing activity from filming to guiding to just getting out on the water. It is organized in descending order, with the most recent entries being first in the list. The journal is comprehensive for reference purposes, so no content will ever be removed. I fished 6 miles of the WI trout stream mentioned in the 8-1-15 entry. I put in at the spot that measured 67 F 8 days prior, only it was 61 F on the 9th. 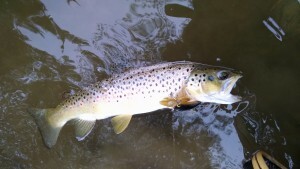 Brown trout prefer water 60-65 F So I knew temp was perfect. The water level had come up a bit from rain 3 days previous but clarity was excellent. I would actually have preferred a little more color in the water to help draw the big browns out of their heavy cover. Luckily it was foggy and/or cloudy most of the day, low light is preferable for brown trout fishing, so that worked in my favor as well. I caught 20 browns and 1 brook, mostly on a #8 gold Husky Jerk. Had I been using smaller offerings, I could have caught many more brooks and small browns (probably more than doubling my overall numbers), but I was targeting larger fish. 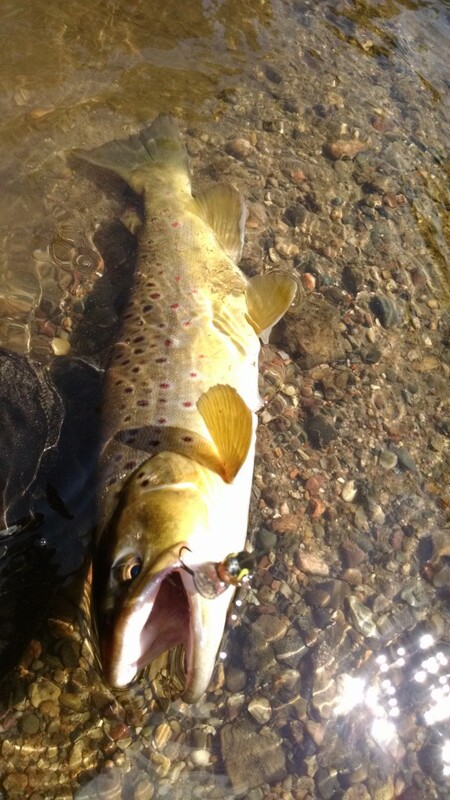 My largest brown was 19”. I had 1 follow into the shallows before spooking that was in the neighborhood of 23”. That one got my adrenaline flowing. Action was the best from 6-10 before the fog burned off. Trout held tighter to cover from 10-12 when it was sunny. Action picked up from 12-3 as clouds rolled in with intermittent drizzle. The bigger browns held tight to overhead cover (mostly wood, but sometimes grass overhangs) in 2-5’ of water with good current. Deep water was important, but good cover and current was more important, which is typical of summer. Pulling larger browns out of heavy cover was tough and sometimes they tangled, but if they were hooked well I could go in and get them because the 8 lb. Nanofil line I was using was tough enough to hold up to it. I was using the green color, because it is less visible. It was important to keep the lures tight and deep to cover to provoke strikes. Most strikes came within a foot of overhead cover. Even with only a few hours of strong sun, the water warmed to 65 F. On a hotter sunnier day the water would have warmed further and action would have slowed considerably. As I walked up-stream, I passed a few cool tributaries adding water of about 59F. Each time I passed one by the water in the main river got a little warmer and the main river was smaller as well. The river was considerably smaller 6 miles upstream from where I started. As the water cools towards the end of summer and early fall, I am going to start working larger down-stream stretches that I think will have larger browns yet. Honest Musky Television pro staff member Clint Van Iseghem and I fished a central MN Lake from 6:00-11:00 am. The weather was gorgeous; foggy, cloudy, humid, and drizzly. It was a slow day of filming, we only moved one musky in the low to mid 40 inch range. It was our first time fishing the lake, and we were impressed by the color of the water and the fact that the water was only 73-75 F in spite of the hot weather trend. I drifted 6 miles of the lower Chippewa River from 6:00 am until 1:00 pm. The water was 75 F with good clarity. The stream flow was 3200 CFS (slightly below normal). I moved no muskies in spite of fishing some gorgeous water, but I did see some lake sturgeon from 30-70 lbs. Two trout streams entered the river along the way and I got out with my digital thermometer to take some readings. In spite of the hot sunny summer weather, the streams were 57 and 58 F respectively. They were small though and not pumping out a significant volume of water. There was a small cut at the mouth of each, and I imagine that if the river were to get to 80 F or warmer, fish may move in and become catchable by casting to the area from as far away as possible. On the way home, I took temperatures at 8 spots on a WI trout stream. It was afternoon, sunny and very hot. The temperatures were from upstream down: 54, 59, 79, 73, 69, 67, 68, and 69 F. The lowest temperatures were in the headwaters were the river was very small. The high water temps were below the dam of a small reservoir were the water is still and warms heavily. Below, with the right ground water and tributary influence, the temperature cooled and habitat was large and ideal. I knew that early in the morning, especially during cloudier weather the stretch that measured 67 F would become prime. It did on 8-9-15. Check that entry for results. 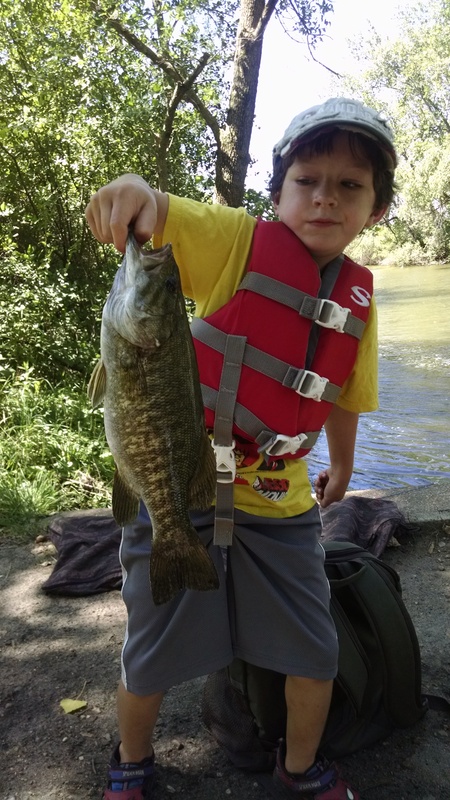 Took 6 year old Dylan out fishing. We hit 2 tail waters below small dams on popular Wright and Meeker Co. MN lakes. The creeks were tributaries of the Crow River. It was hot, sunny, and windy. Water temperature at both locations was 79 F. Recent heavy rains had greatly increased stream flow. The crow was high and muddy (2000 CFS @ Rockford MN), driving many fishing into the tributaries and up to the dams where we were fishing. I shot 3 bigmouth buffalo between 14 and 20 lbs. which Dylan had a blast pulling in hand over hand. We used simple tackle consisting of 6 lb. line, #8 Gamakatsu Octopus hooks, a medium split shot, and a half nightcrawler. 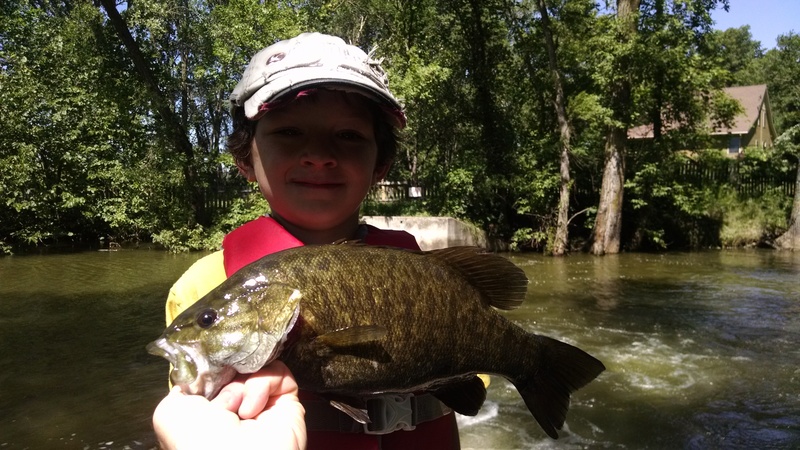 We caught smallmouth bass, redhorse sucker, and carp. We fought a 10 lb. channel cat on a Lightning McQueen rod for 10 minutes before the knot broke 4’ from shore. It picked up the bait and took out 30 yards of line on a screaming run before we were able to get back any line. Fish were biting one after the next and we had a great time.